This app allows customer to enquire a product or to ask quote for a product through mail. Using this app itself you can use your store as catalog mode since this app has an option to hide the add to cart button. Clicking on single button will enable the communication between store owner and customer. Click Enable in the Ask question / quote app. 4. Once the app is enabled, open the app to configure the settings. 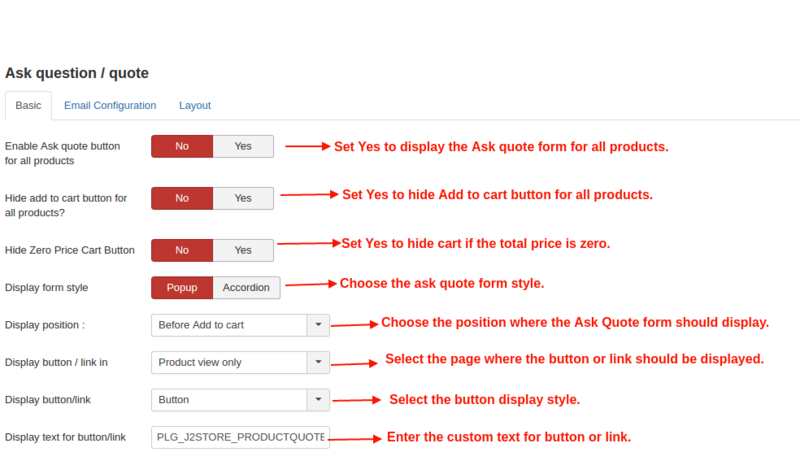 Select YES or NO to enable and disable the Ask quote button for all products. Select YES or NO to hide the Add to cart button. Select the view of the Ask Quote form. POP-UP: Select this to display the ask quote form in a separate pop-up window. Choose whether you wish to have the add to quote form before or after the cart. 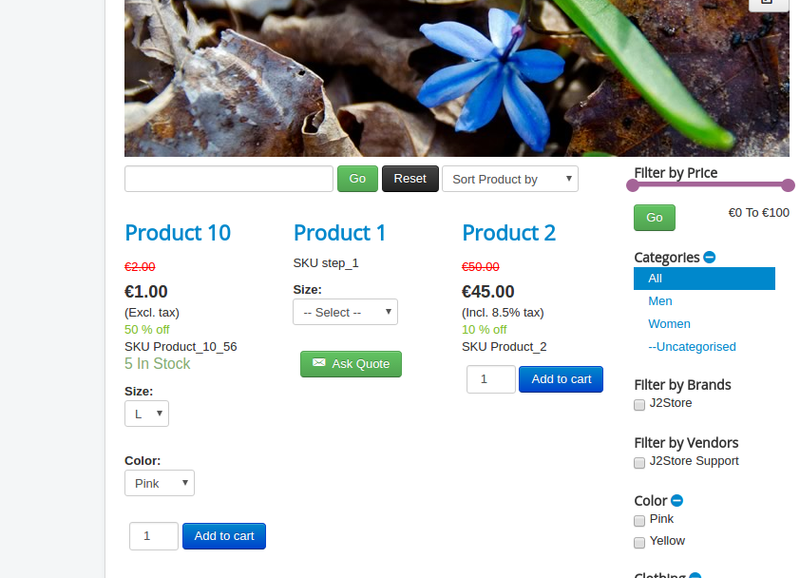 Select the location (Product view, category view, Both views) where the Ask Quote button should be displayed. Selecting display type here will make the text to be displayed in button / link. Change the button text / link text by entering custom text here.Use the language constant PLG_J2STORE_PRODUCTQUOTE_LINK_TEXT to translate the text when you are using multilingual site. To display the custom field information enterd by the user when filling form in an email the customer and admin receive, it is possible by adding the shortcode of respective custom field in the Email body editor. For example, if you are having text area as a custom field in your product quote form, then copy the field name(you can get it in custom field section J2Store > Setup > Custom fields) and paste it in Email body editor. The custom field shortcode should be enclosed with square braces. For example, [message]. 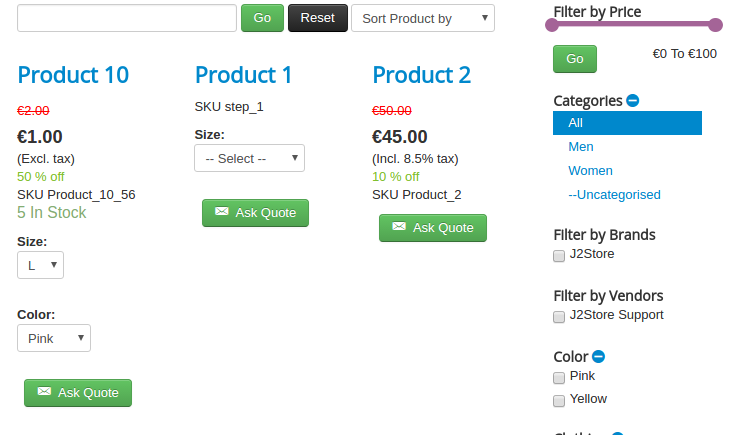 If you would like to add / remove the fields in product quote form without affecting checkout form fields, it is possible in this section. 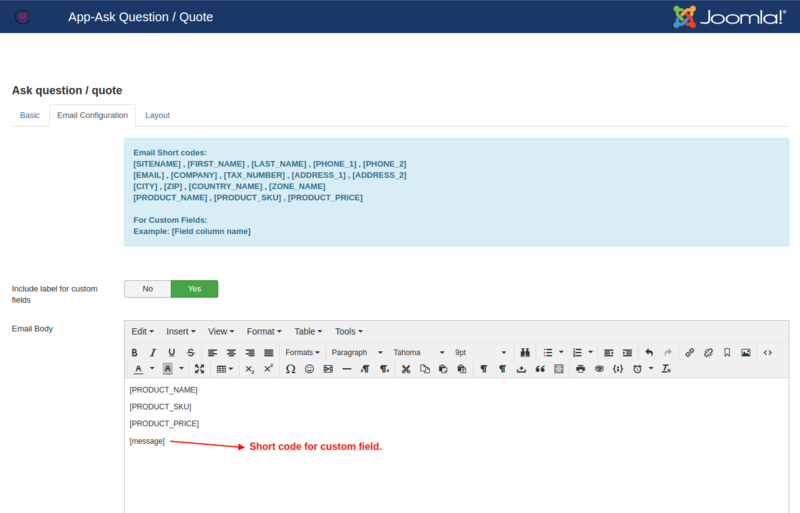 Now, in form layout add the shortcodes of fields you want to display in product quote form. To add the custom field shortcode, copy the field name in J2Store > Setup > Custom fields section and paste it in the form. The field name should be enclosed with square braces. For example, [message]. This app allows you to enable Ask quote button for specific product. Go to Article manager and open the article. Under the J2Store cart tab, navigate to the Apps menu. Enable the Ask quote button by setting YES to Enable ask question / quote. Refer the image below.